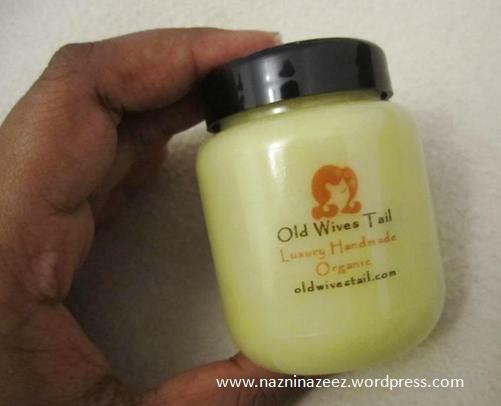 Review : Jojoba & Clove organic oil treatment by Old Wives Tail! In this world that we live in, with various products loaded with chemicals and sold purely to make profit, Old Wives Tail emerges as a breath of fresh air. OWT is a small hair care company, based in the UK, selling handmade, organic hair care products with absolutely no additives or chemicals!. Their main lifetime goal is to eradicate animal testing in the beauty industry and 10% of their profits go to charities that save animals from being tested upon! The first time itself that I heard of OWT and their ethical approach to creating organic, cruelty products, it really appealed to me!. They make oil treatments and mask treatments for hair and also sell hair accessories and cosmetic brushes (with bamboo handles). 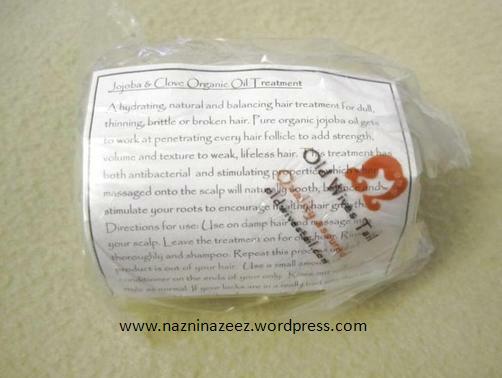 I am delighted to review one of their hair oil treatments today. It’s the Jojoba and Clove organic oil treatment. Each of their oil treatments target different hair problems. 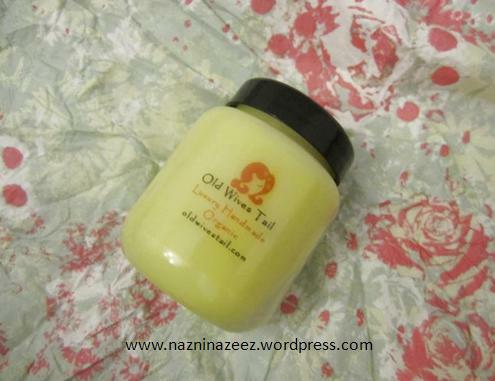 I chose the Jojoba & Clove one because it is made for dull, thinning, brittle and broken hair. After my rebonding experience, my sole goal has been to take as much care of my damaged hair as possible. This treatment seemed just perfect!. 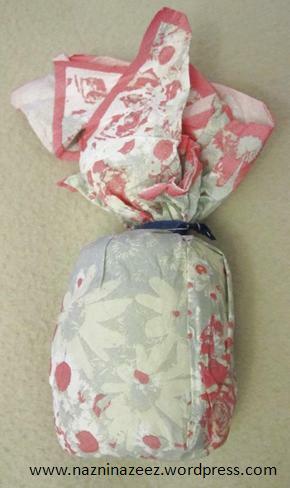 It came wrapped in a very pretty printed napkin, which is so lovely!. I could see that extreme care has been taken to package the product, so that there is no damage caused during transit. Once the napkin was removed, there was a plastic wrap inside with a little sheet which listed the benefits and usage directions of the product. 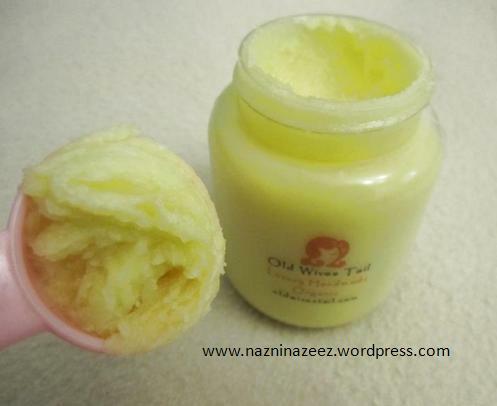 The product is solid/creamy in consistency, yellow in color and filled to the brim of the container. Truth be told, seeing the container, I felt it’s way too small. Looking at the picture on their site, I had expected it to be much bigger. Ofcourse, it’s mentioned there that it’s 100ml but still, that info hadn’t registered with me. 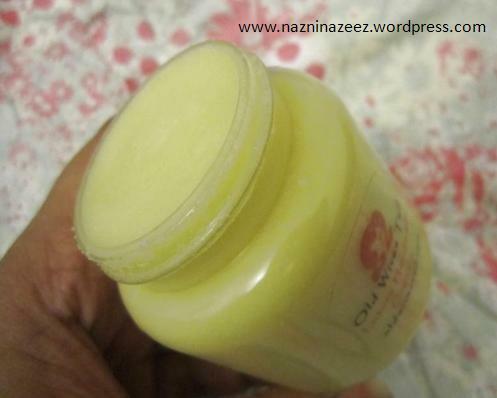 Seeing the container in real, placed in my hand, I wondered how little 100ml actually is. I thought to myself that this surely isn’t going to last me a long while. I have long hair that reaches around my elbow level. You can imagine my surprise when I had to use only 1/2 a tbsp (shown below) for my entire hair!!. It’s solid at room temperature. So, I took a little bit in between both my hands and rubbed them together. Your body temperature makes it melt into a luxurious oil. Then I spread it on my hair, massaging it on the roots first and then onto my entire hair. My husband quite loved this treatment too. For him, I used a little less than 1/2 a tsp. Here is some info about the product from their site – The pure organic jojoba oil penetrates every hair follicle to add strength, volume and texture to weak, lifeless hair. This treatment has both anti-bacterial and stimulating properties which when massaged onto the scalp will naturally sooth, balance and stimulate your roots to encourage healthy hair growth. Directions for use: Use on damp hair and massage into your scalp. Leave the treatment on for one hour. Rinse with fresh water and shampoo. Repeat this process until your hair feels clean and product free. After shampooing you can use conditioner on the ends of your hair only. Rinse out thoroughly and style as normal. If your locks are really damaged, then use twice a week leaving the oil on overnight wrapped in a warm towel. Store in a cool, dry, dark place – A cupboard in a ventilated bathroom is fine to store your hair treatment. As directed, I applied it on damp hair. Once it was washed off, my hair looked shiny and felt healthy. 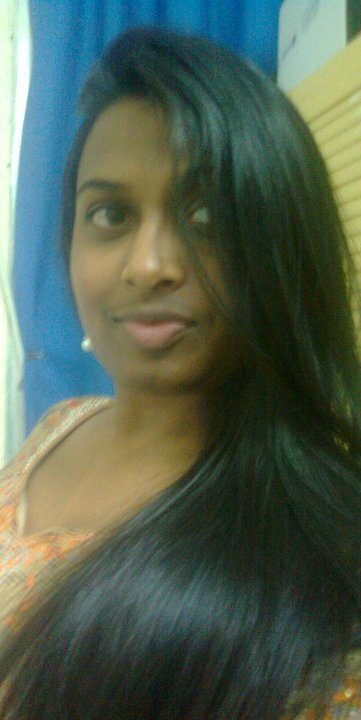 Also, the color of my black hair seemed to look more intense after the treatment! It’s main smell is that of cloves. It’s a beautiful and strong smell that lingers on your hair even after you wash it off with shampoo. I could smell that pleasant smell even the next day!. I use it only once per week. Here are the all-natural ingredients in this amazing product : Simmondsia Chinensis (Jojoba) Seed Oil, Karite Butter Butyrospermum Parkii (Shea Butter) Fruit, Eugenia Caryophyllus (Clove) Flower Oil, Olea Europaea (Olive) Fruit Oil. It is made with certified organic ingredients only. It’s paraben free, sulfate free, gluten free, vegan & vegetarian with no animal testing. I loved this treatment and I really recommend you try it!. OWT offers free worldwide delivery on any order, which is a huge plus!. I got my package by post via Royal Mail. OWT is holding a giveaway on their site, whereby when you follow their rules and participate in it, you stand a chance to win TWO hair oils of your choice!. It’s an excellent opportunity to win and try some awesome, organic hair products!. Go ahead and participate in this worldwide giveaway!. It ends on November 1st, 2014 and winner will be contacted by OWT via email.